It was a gamble seeking out “street meat” for dinner the night before my brother’s wedding. There was a slim but real chance that the platters of sauce drenched meat would wreck havoc on our systems, rendering me a useless bridesmaid and my mom a less-than-cheery mother of the groom. Still, we had to take a chance on this New York City classic. The smells emanating from the flat top grills had us primed and ready. 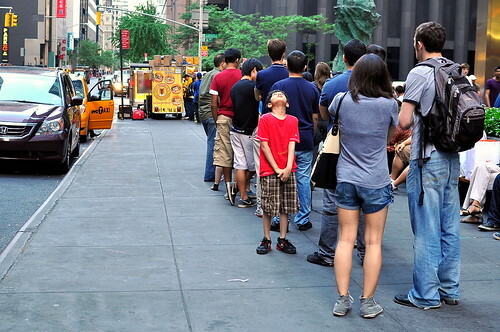 There was a sizable line stretching down the street when The Astronomer, my mom, and I arrived on the scene. With multiple carts claiming to be the real Halal Guys occupying the four-way intersection, I had to text the guru of street meat to confirm the coordinates. The real deal is found on the southwest corner of 53rd and 6th after 6 PM. Thanks for helping a tourist out, Zach! 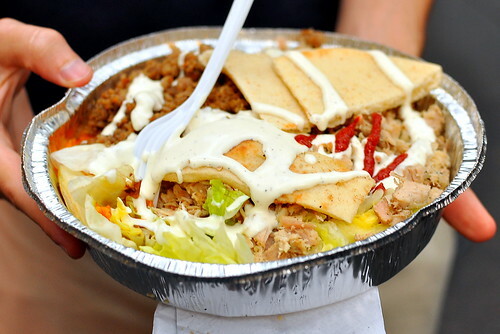 Before serving the hungry crowd, The Halal guys spent a solid thirty minutes grilling pita breads and mincing chicken and lamb. Lots of preparation was required in order to survive the long night of service ahead. 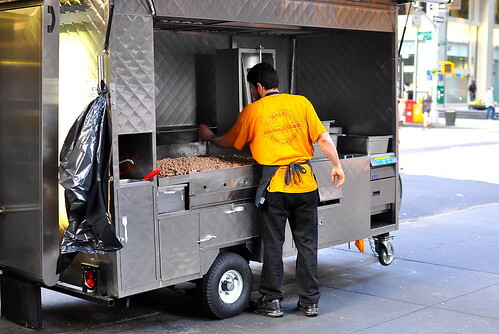 Next to the main cart is a mini-cart manned by one gentleman whose sole job is to cook extra meat. The volume of food that the cart is able to dish out over the course of the night is impressive. Between our party of three, we shared two meat and rice platters. 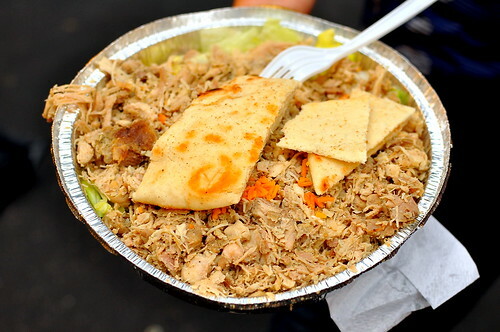 The Astronomer and I picked out the combination platter with lamb and chicken over orange-colored rice with shredded iceberg lettuce and pita bread. 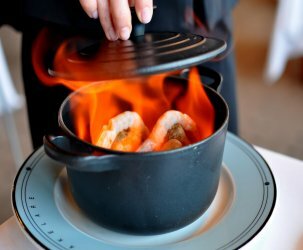 There are two dynamite sauces available on the side of the cart, one white and the other red. The white one is thin and creamy, while the red one is thick and fiery. The Astronomer and I went wild with the white and conservative with the red, while my mom took the opposite approach because she craves a long, slow burn. After incorporating the sauces with the meat, veg, and rice, we dug in with our flimsy forks. The white sauce of unknown contents was the star of the platter. The meat and rice tasted unremarkable eaten alone, but coated in the creamy dreamy sauce, the combination of flavors dazzled and amused. 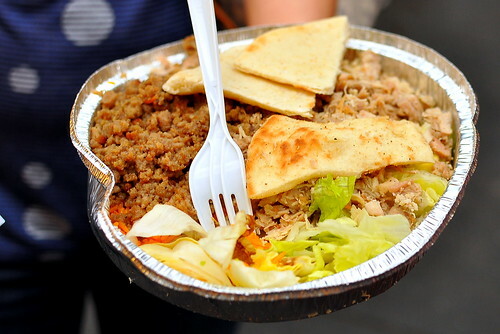 We unanimously agreed that this was a fine platter of street meat—whatever the heck was in it. And just in case you were curious, I was a useful bridesmaid and my mom a cheery mother of the groom the following day. I love live love them. Thank u for the post. I hope the mini-cart man gets a promotion soon! 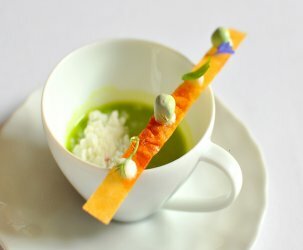 oh my god, this looks so disgusting, how can a gourman with a website full of recipes from all over the world put something like this in his mouth? Oh, Dudo. You’ll get it someday. This brought a tear to my eye. This is right in front of the building I worked in for 5 years in NYC (law firm). I used to eat from here ALLLLLLL the time and when my husband (boyfriend at the time) came to visit me in NYC we ate there and he still talks about how delicious it was. Aaahh, NYC. Doesn’t get much better than this. Hahaha, your mom sounds a wee little bit like DTAB in this story! Glad you both made it to the wedding insides intact! 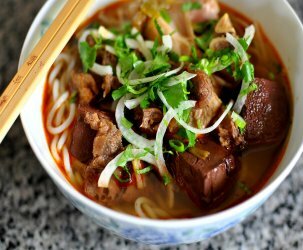 ahhh man that looks delicious. I love me some middle eastern street meat. gonna have to go there if I’m ever in NYC again. 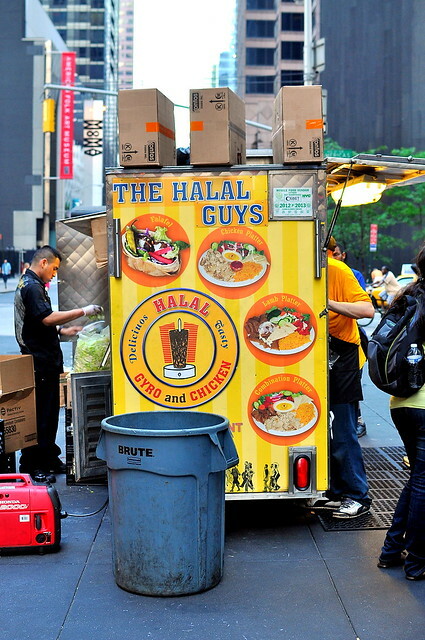 Best halal cart ever! 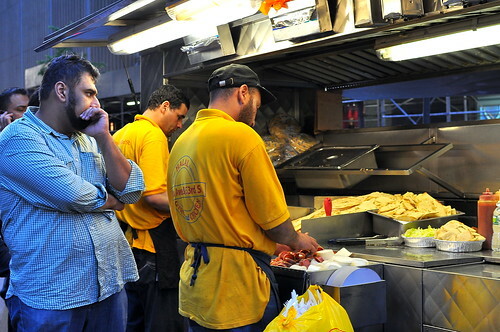 See why NYC loves arab culture.